To delete or Unassign a single shift, simply click on the shift to open the Shift Change window and then click the Delete button or set the employee to None and click Save. The Grid View weekly Schedule View can be used to delete or Unassign (clear) a number of shifts all at once. 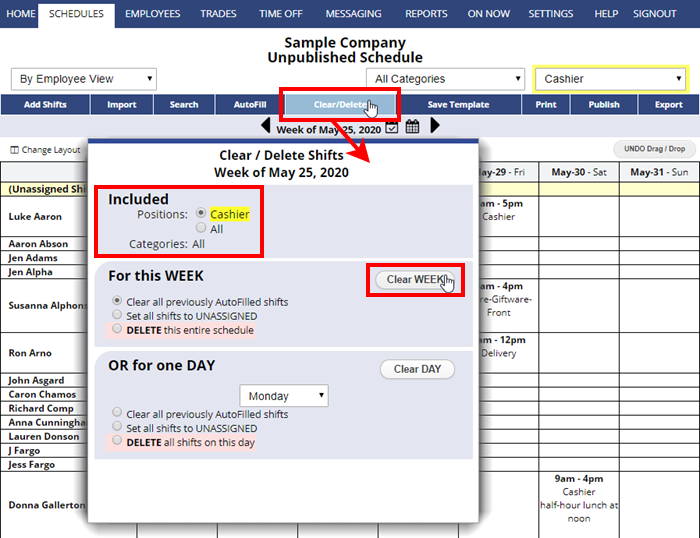 On UnPublished weeks, you can filter your display and then delete shifts for just that Position, Categories, Groups, or delete an entire schedule using the Clear/Delete button. If the box is checked on published weeks, affected employees will be notified about the changes. If you make changes to a published schedule, the affected employees are automatically sent notification messages if the “Send notifications” box at the top of the page is checked and if the employee has chosen that notification.